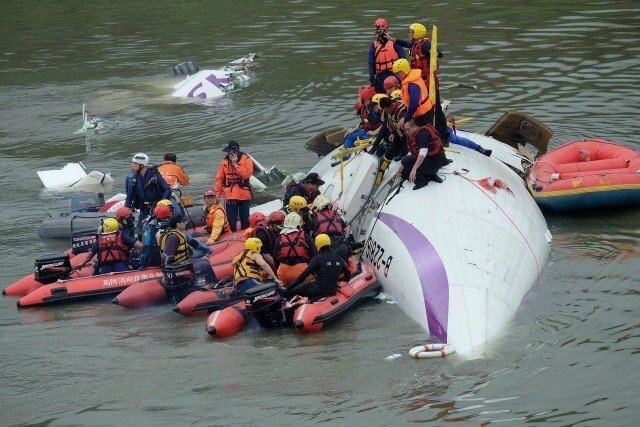 A TransAsia Airways plane with 58 people onboard clipped a bridge and crashed into Taiwan’s Keelung River near the capital of Taipei, killing at least 12 people. The fuselage of flight GE235 is now half-submerged in the Keelung River and lying on its side. Rescuers on boats have cut it open to gain access to people trapped inside. Officials say 16 people have suffered injuries, with some taken to hospital. Thirty people remain unaccounted for. The ATR-72 turbo-prop plane had just taken off from Taipei Songshan Airport and was heading to the outlying Kinmen islands, just off the coast of the south-eastern Chinese city of Xiamen, CNA said. Flight controllers lost contact with the plane at 10:55 local time. Footage of the plane filmed from inside passing cars showed it banking sharply, hitting a taxi and clipping the bridge before crashing into the river.